Our restaurant for today is Todd English Food Hall, which I mistook for a posh and pricier version of SM Aura's food court when it was still under construction. (Major LOL!) It's located at the Sky Park area of the said mall. Who's Todd English, btw? He's a celebrity chef and also dubbed as the richest celebrity chef in the USA, at least. He's got tons of restos under his belt and he's even a T.V. personality, so I wouldn't doubt that fact! 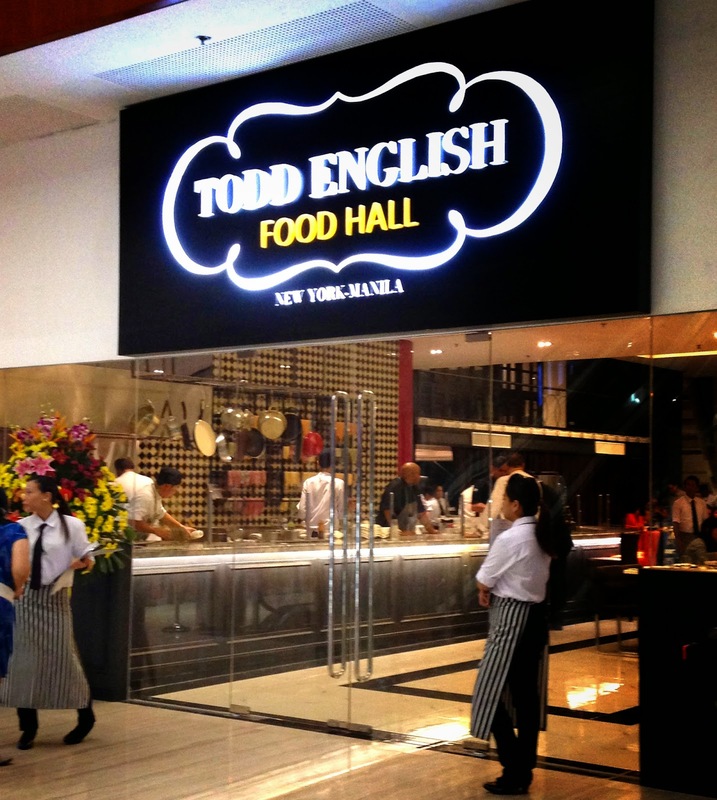 Todd English has opened is first restaurant in Manila and I had to try it just to know what makes him special. Click READ MORE for a preview of their menu! Todd English's theme is like a food court and a typical restaurant rolled into one. It's reminiscent of a food court because there are 9 food stations inside the huge restaurant, but the food is handmade and you don't really go up to the stations to help yourself with some grub-you have to order from the waiters. They have sushi, pasta, pizza, cheeses, rice, and grilled meats. When I visited the restaurant, they've just been open for a couple of days and I chanced upon Todd English himself and his son, Oliver English in there-they're so hands- on! Artisanal Cheese Board- We opted for Gouda cheese and we got dried apricots and cranberries on the side. I forgot how much this appetizer is, but I remember that it's a lil' pricey and I'm surprised to see how small the portion is. U.S. Hanger Steak- Strips of melt-in-your-mouth meat formed into a tiny wreath, sitting atop mashed sweet potato(?). It has Arugula leaves on top sprinkled with a citrusy dressing. It's supposed to have roasted bone marrow with it, but I have not tasted it in the dish, let alone saw it. Sweet Potato Fries- Because I love Sweet Potato Fries! For a side dish, the serving is quite hefty and I enjoyed that slightly cheesy taste. 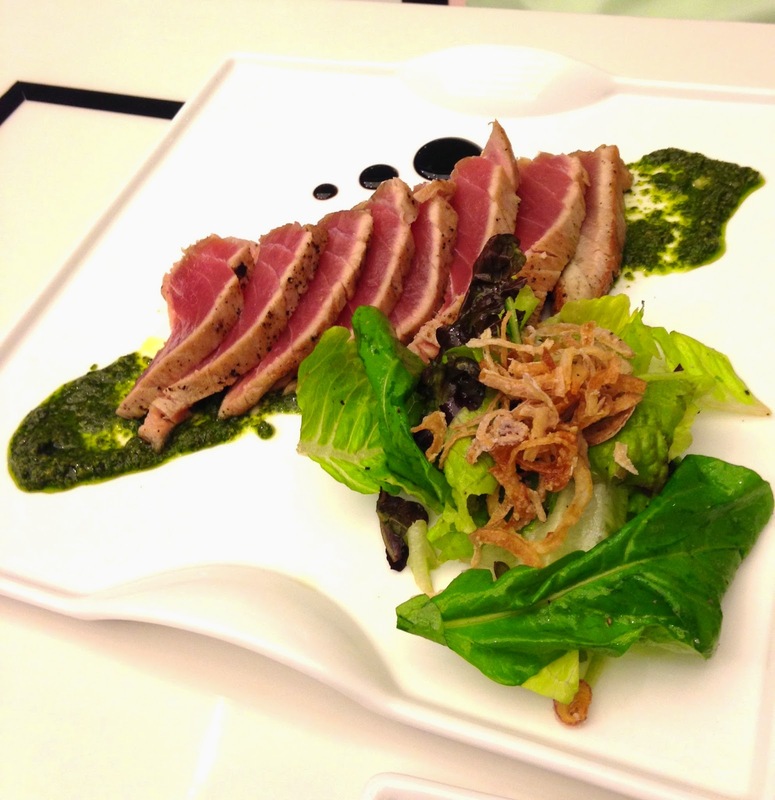 Seared Tuna Loin- This healthy dish comes with a simple salad on the side. I liked the salty-citrusy taste of the tuna. OMG Cake- I was told that this dessert has just earned its name during the opening and it was a pretty funny story: This dessert was served that time and people kept on saying "OMG" upon tasting it and the rest is history! It's a small piece of warm chocolate cake with chocolate mousse, chocolate popcorn, chocolate crumbs, and sea salt served on top of a thin chocolate paste. In short, it's chocolate overload. 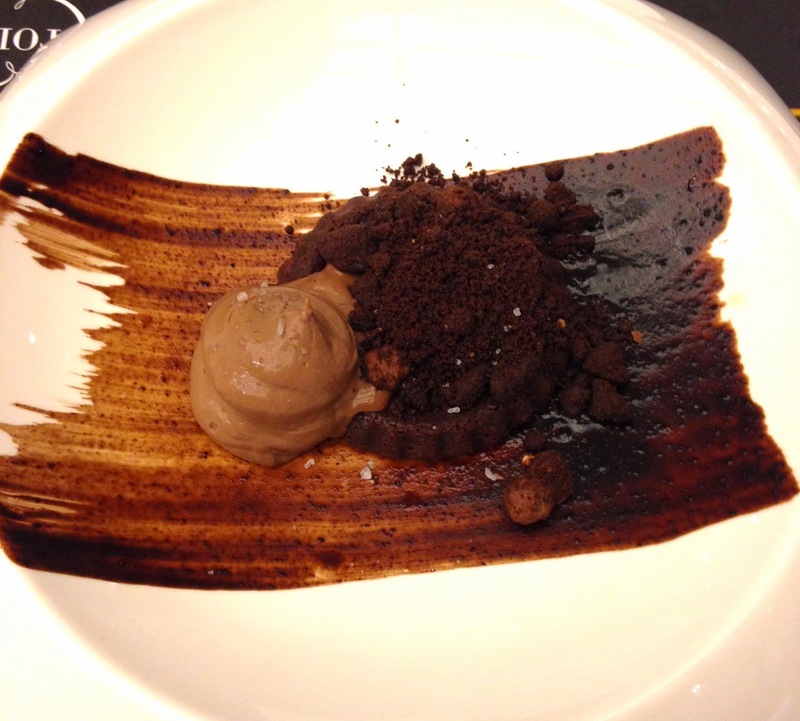 I liked the dark and milk chocolate medley and the various textures it had, but the price killed it for me. I just thought it was way too expensive for a tiny and good- tasting dessert. The food is very decent, but I wish the serving were a little bigger. (Sorry, Todd English, huge eater over here) I'd go back here if I'm not that hungry (which is a rarity) and I don't mind spending on some fancy dishes. Regarding the place, I love that it's super roomy and well- lit, but temperature was sooo cold that our meals turned cold a minute after arriving on our table! Service was very slow, which I forgave though because they were on a soft opening when I visited-hope it has improved by now. Lastly, there weren't any other desserts available except the OMG Cake, although there were a lot of sweet stuff on display. I believe they only have one dessert per day and it changes from time to time, but next time, I hope there will be more to choose from. a bit pricey and yung servings ang liit. More than anything, I'm just incredibly happy to see that more and more international restaurant establishments are deciding to open in the Philippines. Nakakatuwa. I love your occasional posts like these because you are informing your dear readers to have their options or if they planning to eat there someday maybe on a special event so we can be prepared with the gastos hehe.